You all saw Bree's nails yesterday. Today are the nails I wore out last night. After working so hard on Bree's, I wanted something more simple, and easy to do, and you can never go wrong with a glitter. No matter what anyone tells you in life, you can never go wrong with glitter. Rules to live by. The base (below the glitter) is Cha Cha Cha (China Glaze). I really am not a huge fan of this color, but I knew it would come in handy for something! Hiding it is Here Comes Trouble (ORLY). Oh man I had a hard time covering that gorgeous green glitter with designs, but I just didn't feel right with only one color. The stripes were done with Bad Chick and Time Off (Sinful Colors) and Gold Digger (Color Madric). I loved wearing this manicure last night, which turned out to be quite the adventure. From the fight breaking out in the bus line when we got off to the pepper spray that leaked into the bar we first bought drinks at, it was an amazing night. Best thing about March: All the awesome green nail art! This is no different - I really love it! So true. I was adding tags to my post, and noticed I had never used "green" as a tag. Now I've used it three times since March began. Check out the next entry I made...it features a rather unusual green. Oooh, nice stripes. Would look good on pretty much any color. Gorgeous! 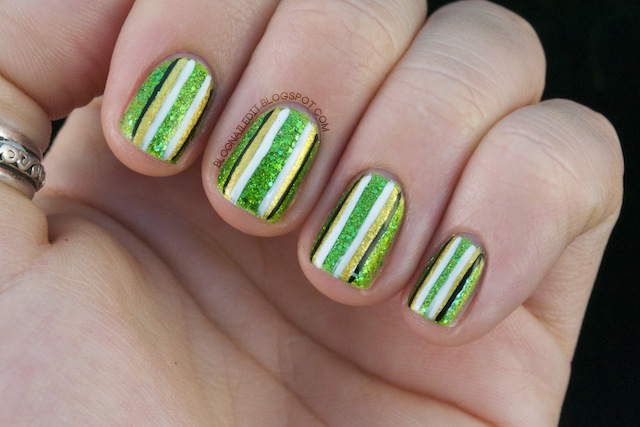 Love the green glitter and the nail art is simple but really effective. Looks fab. Rule to live by: always add glitter. These are gorgeous! You really have been doing some really cool manis lately. Sorry I've been a slacker commenter! Thanks! And no, no one is a slacker. I rarely comment on my favorite blogs, but that doesn't mean I'm not a huge fan. I love how this turned out. The colors you used look amazing together.